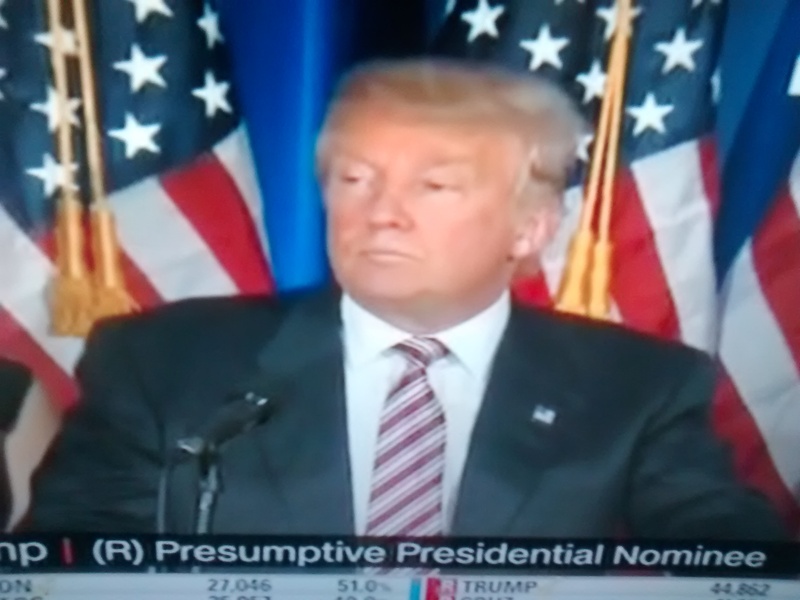 ” Arrest Your Fall in Ratings and be Competitive Candidates – Strategy II ” – July 4, 2016. July 4 is a memorable day in American History filled with memories, heroic and tragic. The presumptive presidential nominees of both the major parties (Democratic and Republican) have an excellent opportunity to mark the 2016 Independence Day as significant, responding with gratitude and warmth towards the American citizenry and make his/her political periegesis forward in the pursuit of Presidency. Again I am not batting for either, being a resident of India, but my rumgumption drives my grey cells to offer 3 concepts that Donald Trump can apply if he considers holding a meet/rally in Philadelphia to give expression to the same and play the field as people would desire. 1. Credibility and Trustworthiness : People judge and see Donald Trump as a person who says things as they are. That, nevertheless, has placed him in not so good light among his audience as well as his critics/opponents. He is also seen as flip flopping on issues that makes him vulnerable while emboldening them painting a picture of a person who could not be relied upon. On July 4, if he delivers a speech to the people anywhere ( will it be in Philadelphia? ), he may well attempt a transformed self by “narrating his experience when he felt he failed in business or in any aspect of his career in the past”. He may well add, ” Yes, I admit I made a grave mistake (not a blunder)”. People will be able to gauge his sense in real terms and may begin to trust him more than ever. It is the quality of genuine, credible, and authoritative leadership when he himself attempts to erase the flawed aura that either surrounded him naturally to his discomfiture or driven by people with intent. He will also be in a position to establish fresh connections after making a big impact. People who generally are not used to hear himself admitting failures will possibly adore the less pretentious nature and style of his admission and start embracing him without fear. 2. Power of positive view : Trump may regard the observations and comments of his opponents as unfounded and class his opponents as small minded people of little importance. His aim from this moment should instead be on obliterating the depressing and despondent view of people with a dramatic change in perspective. His fair and excellent treatment of everyone may even sound strange and surprise many to the extent of total disbelief but certainly with faith firmly restored. 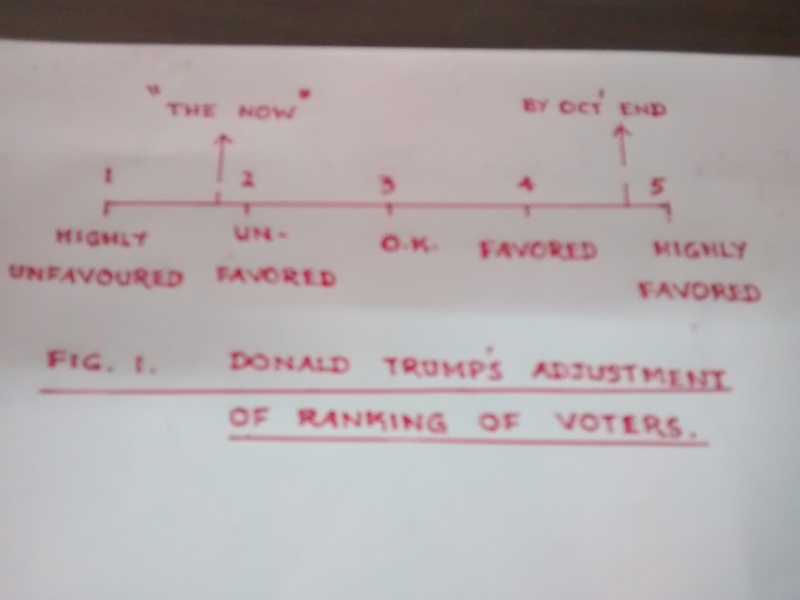 The figure below presents Donald Trump’s adjustment of ranking of voters. He is at present a few notches below ‘2’ and will strive to move to ‘4.5’ or above by October end when the General Election mood will be fully attained. It is like taking everyone’s comments in a positive manner with the “power of positive view” standing beside firmly. For this to happen, he needs to repeat his value points in every forum he gains access to. 3. Setting goals to his staff : Donald Trump should reveal his clear intentions and possibly inaugurate a “fresh task program” for his executives/staff with a chief monthly goal of one or two key ideas that can scoop a pool of voters (in terms of 10s of 1000s or even 100s of 1000s), contributing significantly to incremental growth in support for the party. It is like turning around a moribund company riddled with complex problems including cash shortage into a sustaining, profitable one. Donald Trump has already his eyes on this task nationally in terms of people welfare. In a nutshell, smart moves to execute and realise the fruits of the above three ideas will be a marked change that can push people without being impossible. This will pave the way for Donald Trump’s intention to bring about disruptive social changes in America. The “true” Donald Trump will also be standing before the people.